VEGAS: STAGED “DEAD TIME” CALL? Ryan is in Las Vegas holding “Dead Time” to try to communicate with Emily’s spirit. According to the theory behind Ryan’s “Dead Time,” all electronic devices are supposed to be turned off. This should include all cell phones. Chip asks Emily’s spirit “to make some audible noise” and Ryan’s cell phone rings. Everyone acts surprised as if Emily caused the phone to ring. The illusion might have one believe Emily’s spirit caused the phone to ring, which turned out to be Katrina calling. Let’s take a close look at what’s said during the “Dead Time” phone call. Ryan gets a cell phone call during “Dead Time,” alluding to a paranormal causation. Chip, Ryan and others act surprised. Here are quotes in the gray colored boxes from the phone call, with my comments interjected. Why is Ryan surprised? He’s the Director of the Paranormal Research Society and is the one who should have known to have his cell phone turned off. But, for some reason, his cell phone was left on. Highly suspicious. Ryan answers the phone with a “Hello?” Don’t you think caller ID would have shown the call was from Katrina? Again, Ryan uses the word “family” to describe a meeting with what was most likely Emily’s mom, Sheila. I believe Ryan slipped when he told Katrina he might have more questions to ask “her” meaning Sheila, in a previous scene. I say “slipped,” because throughout the episode, Katrina says “family” three times, Ryan says “family” twice, and a screen caption shows “Family” once. Revealing mistake? Katrina just left? If “Dead Time” is from 3:00 AM – 4:00 AM (Pacific time) in Las Vegas, Nevada, that means Katrina was calling from San Antonio, Texas, between 5:00 AM – 6:00 AM Central time. What kind of interview would take place/end at that hour? My personal opinion is that the interview actually occurred over this time, but was premeditated to coincide with the 14th anniversary date of Emily’s murder. While in Texas, there were no scenes of Katrina showing any newspaper articles about Emily. And, this episode never showed the thersayeary.tripod.com Website that does have what are supposed to be ALL newspaper articles regarding Emily- none of which mention a scar on her lip, or that she spent time in juvenile detention. I believe this is a misstatement on Katrina’s part. So Katrina, correct me if I’m wrong. “Unsolved Crimes” http://unsolved-crimes.com/garcia.html mentions the scar above Emily’s lip. Katrina: But what nobody outside the police knew that I found out direct from the family is that Emily was three months pregnant when she died. Emily being pregnant has been on the Website for many years. Newspaper articles dating back to 1993 are posted on the same Website and mention Emily was three months pregnant. 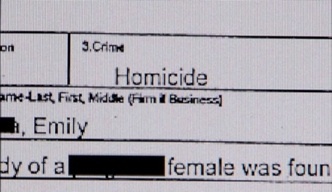 The coroner’s report on the Website stated she was pregnant. 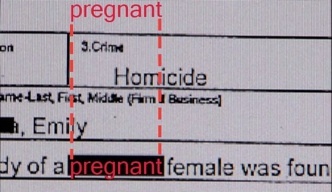 But most important and revealing of all, one of the police reports shown during a search of a “national police database” in the “Vegas” episode shows with almost certainty that Emily was pregnant. Katrina saw the paper that Ryan handed her about Emily, and Katrina says “My gosh.” So, Katrina knew BEFORE she flew to San Antonio, that Emily was pregnant. Ryan: She was murdered. Emily was raped and held hostage for 13 days, and then they dumped her somewhere. Whenever they found her, she had been dead for only 20 hours. • If Ryan knew all of that information, don’t you think the date they found Emily’s body was given, also? Ryan: Director’s Log: Day Two. We found a young girl in San Antonio, Texas, whose information remarkably matches with what Savannah has told us. She was the victim of an unsolved murder several years back. She was about Savannah’s current age when she died. Now, I want to show Savannah the picture we found of the murdered girl in San Antonio to see what her response is. • Again, if Ryan knew that, don’t you think the date (25 Feb 1993) they found Emily’s body was known, also? Ryan: We looked her up. 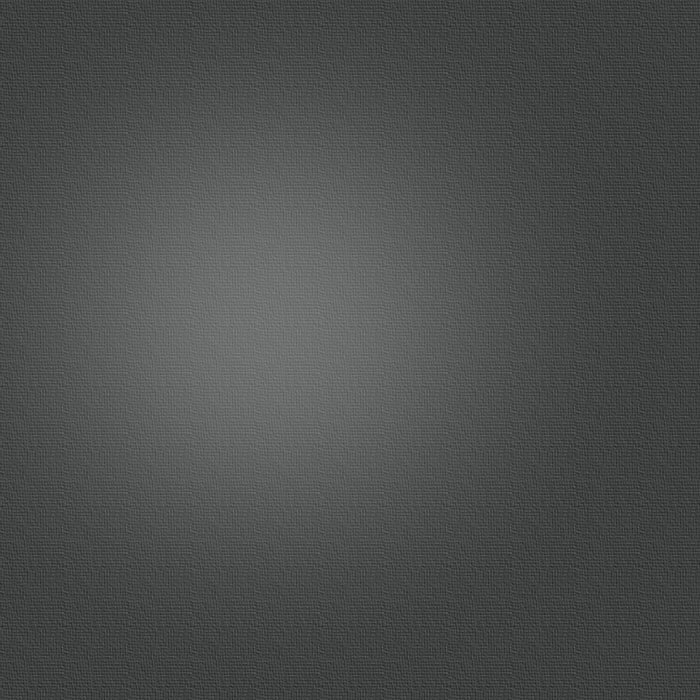 This website came up. So you think it’s--it is her? • Show me a website about Emily Jeannette Garcia that doesn’t show the day she was murdered, 25 Feb 1993. Katrina: Nobody else could know that. Again, the information about Emily being three months pregnant was published in a couple of newspaper articles back in 1993, AND posted in many places on the “family” website. There is a fair amount of information that indicates that at least Ryan knew the date of Emily Garcia’s murder, and used that knowledge to plan ahead, to hold an interview with Emily’s “family” (again, this was most likely just one person, Emily’s mom, Sheila). There was no need to send Katrina to Texas to use a private investigator to help find the “family,” because Sheila’s (Emily’s mom) phone number is on many pages of the theresayeary.tripod.com website. Consider this- do you think Paranormal State would pay for everyone to go to Las Vegas, Nevada, just because a teenage girl claims to see a spirit? Or do you think travel plans, and the interview date for the “family” was planned in advance to purposely coincide with the 25 February 1993 anniversary date of Emily’s murder?